Please see the opening hours of the water park. 2 days in a row at Serena 41,00 € 15 € extra upon purchase of a day ticket. Must be used on the following day. 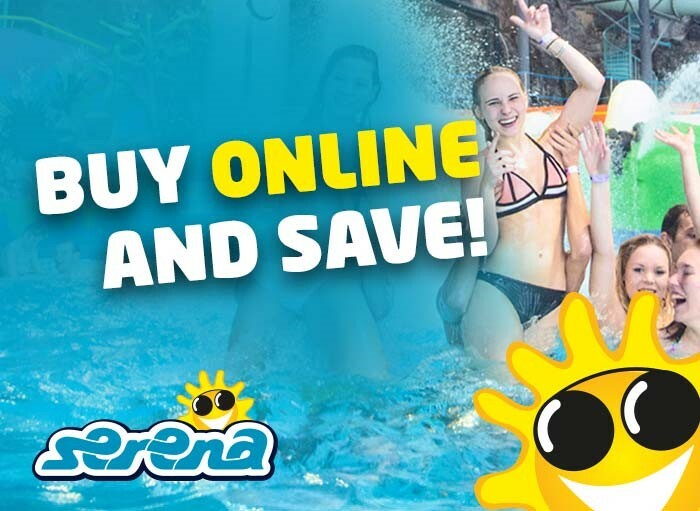 35,00 € under 12 years Includes full day water park & full day ski lift tickets. Must be used the same day. Fun for the whole season! After you buy an online ticket, you will receive a confirmation email, a receipt, and a link to download your online ticket. NB! Neither the confirmation email nor the receipt grant access to the park, be sure to download the actual ticket(s) in advance. Print the ticket on paper OR display it on your mobile device at ticket sales. A screenshot is not a valid ticket. Children 0-3 years free of charge. Children under 10 years must be accompanied by an adult. The parking fee is 1 € / h or 5 €/day/vehicle. Payment by credit card or coins. When the outdoor water park is open (summer season June-August), you must purchase a ticket before entering the water park area. We accept cash, all major credit cards, Smartum-, Virike-, and TYKY- vouchers, TYKY-Online card, Smartum card & online payment, Ticket Mind&Body and Duo cards and mobile ePassi (Internet payment via ePassi not accepted). Please notice that lockers work with two euro (2 €) coins. The deposit is returned when you open the locker. We do not rent swimsuits or towels. We recommend you to check our Shop, where swimsuits and towels are available. Ticket office closes 1,5 h before the park closes. You can buy the ticket from the water park shop from that on. The water slides and outdoor pools are closed 30 minutes before the park closing time. The indoor pools are closed 15 minutes before the park closing time.